AvéULTRA can change your life. It can do that by boosting your immune system. In thisage of ‘never enough hours in the day,’ you might feel like you’re constantly spread too thin. Whether it’s with work, children, commuting, or all of that and more, health is sometimes pushed to the wayside. You might not always have time to exercise. Cooking healthy meals can be a fantasy rather than a reality. Now, the best advice is to eat healthy and exercise – to adjust your life and make those a priority. You should work toward that. But, in the mean time, you’re tired. When you’re tired, not getting enough sleep, not getting enough nutrition, and not getting enough exercise, your immune system also suffers. When your immune system suffers, you’re more susceptible to outside threats. Even more than that, it’s easier for you to feel weak and drained, even when you’re not sick. Your immune system isn’t able to keep up with even it’s daily responsibilities to keep you functioning well – never mind fighting things off. A natural supplement like AvéULTRA can give your immune system the life and support it needs to get you up and running at near optimal capacity again. How? We’ve come up with 5 reasons why you should take AvéULTRA. Yes, AvéULTRA reduces fatigue. It coordinates all the moving parts (cells) of your immune system and gets them working together and with more energy. This enables them to give you more energy. Yes, literally. It will make your days happier and more hopeful. When you have that boost of energy so you don’t have to drag yourself around everywhere, you feel like you’re more in control and more like your old self. Another benefit that comes along with AvéULTRA is its ability to clear your mind. When you’re not as fatigued, your thoughts stay more straight in your head. They don’t jumble as much. Again, you’ll start to feel more like you again. If you’re looking for a supplement that has some good research behind it, AvéULTRA is exactly that. The formula behind it was created based on research done by the same doctor who helped discover vitamin C. It’s also been tested around the world by several researchers. 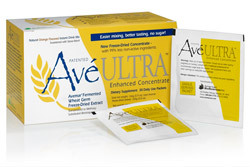 Most people start to feel the benefits of AvéULTRA within weeks – sometimes even days of starting to take it. Don’t waste more time just barely getting through your days. Experience what thousands of others already have. You don’t need medication to boost your immune system. AvéULTRA does the trick and allows your immune system to do its job – so you can do all of your jobs. And, when you’re feeling good, you can start to build the exercise and healthy eating into your life too.